I hope all are well wherever you call home this Friday morning. I am doing well myself in my home away from home Hawaii! Having just completed my last official gig and posting the story on that page, I hope you found it interesting and fulfilling as I did. Words cannot describe the feeling and relief I feel at this time, being here and enjoying the island from Yohana’s home is more than I could’ve imagined or wished for. Somehow the struggles and extreme conditions I faced at times these last few months just seemed to have melted all away for now in the warm waters of the Pacific. I know when I get home that I will revisit every stop in my mind in order to be able to put it in a book form but for now I will enjoy the fruits of my labor so to speak and lavish the next six days I have left on the island. Yohana and her son have departed for San Diego to celebrate his birthday in LegoLand Park and she has generously allowed me the complete use of her home and automobile while she is gone. I am still helping her out with some more home improvement projects in her absences and will benefit from the extra money to get back to Arizona next week. She is the gift that keeps on giving much to my delight, and I guess it’s the way she approaches life in general. I met her when I lived here last and was working part-time for a landscape contractor who was and probably still is a total tool. I ended up in her good graces long after she gave him the boot and she continued to hire me much to his chagrin and distain. Her belief in meant to be and Karma shapes her personality to the point where everything she says and does is impacted by those principles. Very different from the way I was raised and have lived my life the past forty years as an adult, but it certainatley has worked for her and have learned a lot from her during our long conversations about life, love and family; hard to argue with success when it’s staring you in the face! She loaned me a popular book called ‘The five love languages’ and swears by its theme and content. I could some help in that department after three failed marriages and now that I’m heading home in a couple of weeks and on my wish list to do besides writing my book is to find a person to share the next part of my life with; hopefully the rest of my life as time if running out for me at 55 years of age (please don’t write me and tell me 55 is young). I have so much more to tell you about this amazing lady but it will have to wait until I can write her story in the book along with so many other great people I have met along the way! Meanwhile I have to keep an eye on my waist line because I’m eating like a mad man here and I probably already gained a few pounds from all the great food available. It is so good but much of it is so fattening and unhealthy as good food usually is. 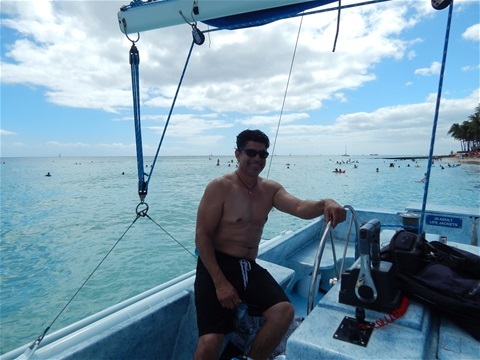 I had a great time in the world famous tourist trap Waikiki and have always enjoyed the Catamaran rides one can take right off the beach. The waters here are calmer and very shallow and safe for children and older folks, if you can put up with the tons of people and commercial like setting. I enjoy both the secluded and tourist spots myself, feeling happy just being here atlas. Well friends, I thank you for checking in and wish some of you were here with me if this is your kind of thing, especially if you have never visited the islands before. I will write you again before I depart for San Francisco next week but will continue to post many pics and videos of this beautiful place, have a wonderful day!